If you are looking for a great round that will pretty much do anything you need it to do, then the .223 Remington is the round for you. Great for hunting, varmint eradicating, match and range shooting, and self-defense and proven by military and law enforcement use to be incredibly effective, you have yourself one of the best rounds you can find right here. In fact, this round is lightweight and has an extremely low recoil as well, letting you carry more ammo and shoot longer. 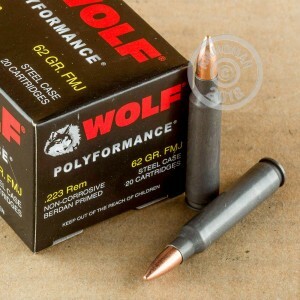 When it comes to cheap but quality ammo, Wolf has your back. 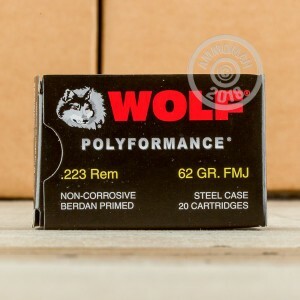 This Wolf WPA Polyformance ammo gives you some of the best components and attributes of Wolf ammo at an incredible price. Don't miss out on this 62 grain, full metal jacket, accurate and reliable Russian ammunition.